U.S. #3145 – From the 1997 Football Coaches issue. 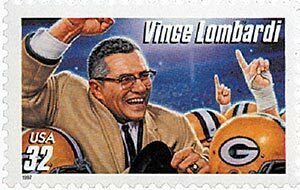 Vincent Thomas Lombardi was born on June 11, 1913, in Sheepshead Bay, Brooklyn, New York. The oldest of five children, Lombardi grew up working in his father’s butcher shop, which he eventually grew to dislike. When he was 12, Lombardi began playing football with an uncoached but organized league. At age 15 Lombardi entered a program to join the priesthood at the Cathedral College of the Immaculate Conception. He played on the school’s baseball and basketball teams and continued to play football off-campus, which was against school rules. After four years Lombardi left the school for St. Francis Preparatory. There, he helped found the Omega Gamma Delta fraternity and played fullback on the school’s football team. After graduating Lombardi attended Fordham University on a football scholarship. 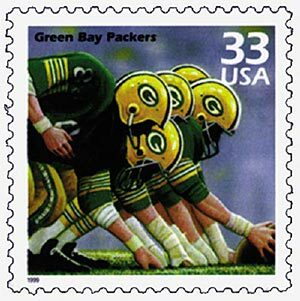 U.S. #3147 – The Football Coach stamps were issued with and without a red stripe at the top. Lombardi graduated from Fordham in 1937 and briefly played semi-professional football with the Wilmington Clippers. He then found work as a debt collector, attended law school for a semester, and joined the Brooklyn Eagles. By 1939, Lombardi wanted to marry his girlfriend, but needed a steady job to support a family. So he accepted an assistant coaching job at St. Cecilia Roman Catholic High School in New Jersey. He served under a former Fordham teammate and also taught Latin, chemistry, and physics. When the head coach left three years later, Lombardi was promoted. The following year, his team was honored as the top football team in the country. In the coming years, they won six championships under Lombardi’s leadership. 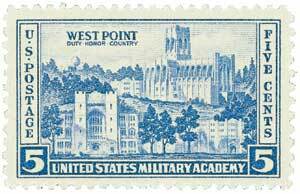 U.S. #789 – Lombardi coached at West Point for five years. In 1947 Lombardi returned to his alma mater to coach the freshman football and basketball teams. He then spent a year as assistant coach for the varsity football team. Lombardi went on to take a job as offensive line coach for the West Point football team. His later success is often credited to the military discipline he witnessed at West Point under head coach Earl “Colonel Red” Blaik. Lombardi then took on a larger coaching role for five seasons, three of which were successful. Lombardi joined the NFL in 1954 as offensive coordinator of the New York Giants. Within a few years, the Giants became a championship team and head coach Jim Lee Howell credited much of that success to Lombardi and defensive coordinator Tom Landry. It was while working with the Giants that Lombardi introduced a new strategy known as rule blocking (he called it “running to daylight”), in which offensive linemen blocked an area rather than a specific player. 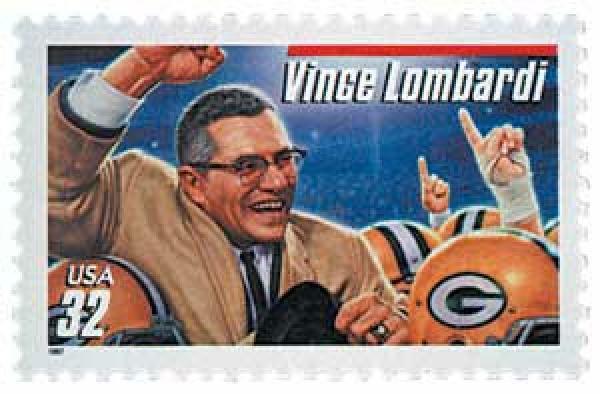 U.S. #3188d – Lombardi led the Packers to win the first two Super Bowls. Meanwhile, Wisconsin’s Green Bay Packers had a bad season in 1958, earning just one win. It was their worst season ever and they were in danger of being shut down. Then on February 2, 1959, Lombardi accepted an offer to become the Packers’ new head coach and general manager. Lombardi developed intense training regimens for the team and expected nothing but the best. The Packers finished with a 7-5 record in his first season, and Lombardi was voted “Coach of the Year.” Lombardi’s forceful personality sparked confidence in his players and reinforced a belief in the team’s power to overcome obstacles. From 1959 to 1968, the Packers racked up 98 victories, 30 losses, and 4 ties, for a .758 winning percentage. The franchise was one of the most successful in the 1960s, winning six divisional championships, five NFL championships, and the first and second Super Bowls. Lombardi became a national symbol of single-minded determination to win. Believing that “winning isn’t everything…but wanting to win is,” he embodied the ideals of honest-to-goodness hard work and reward. In 1968 Lombardi stepped down as head coach of the Packers, though he stayed on as general manager. He then became head coach and manager of the Washington Redskins. Under his leadership they had their first winning record in 14 years. U.S. #U618 – The Lombardi Trophy is awarded to the winner of the Super Bowl. Amidst this success, Lombardi’s health began to decline in 1967 as he suffered from digestive tract problems. In 1970, doctors discovered he had terminal cancer. As he sat in the hospital, friends, family, and players all visited him. He even received a phone call from President Nixon telling him that the nation was behind him. In his final days he stated that he only wished he could have accomplished more. One of the most successful coaches in NFL history, Lombardi died on September 3, 1970. The following year, he was inducted into the Football Hall of Fame. 3 Responses to "This Day in History… June 11, 1913"
Vincent Lombardi has certainly defined an era as both a coach and strategist. His lasting impacts within society will always be remembered on Superbowl Sunday in the distributing of The Lombardi Trophy. God Bless! What I found interesting in this article was that he was a very learned man, teaching Latin, Chemistry, and Physics. Very impressive. The Lombardi trophy, Lombardi time (as indicated by the clock at the front of Lambeau ) ,Titletown are all part of the legacy of coach Lombardi. George Halas said of him that he was the only man he referred to as “Coach”.